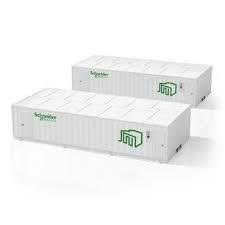 The Schneider Electric SmartShelter Module is a spacious, prefabricated solution offering integrated, scalable, flexible, on-demand IT infrastructure. Modules are purpose-built, secure, weather proof, and fire-rated, offering the maximum level of features and performance. SmartShelter Modules offer a practical alternative to building a new or expanding existing IT space. Minimize construction costs and complexity by having your IT space built offsite, in a factory environment. Installations such as hospitals, universities, and businesses with multiple offices can benefit from SmartShelter Modules by reclaiming valuable space for their core operations. Move the data center outside or into a simple building shell as a stand-alone system that has physical security, power and cooling redundancy, and can be remotely monitored and managed with a full suite of DCIM software. Preserve CapEx by growing infrastructure with demand in smaller increments and adjust plans for future expansions with repeatable and flexible designs. SmartShelter Modules contain a complete data center physical infrastructure, assembled and tested in a single- or multiple-module configuration to provide a fully functional data center.